First look Unveiled on Wednesday and already shipping, BlackBerry’s square-shaped Passport is a Marmite device – people will either love it or hate it. It’s quite uncompromisingly the most unusual smartphone in modern times. BlackBerry may as well have called it the “WTF”. But you can’t fault BlackBerry for not thinking about trying to improve the everyday basics of phone calls, reading and editing. The key difference of the Passport, apart from its striking shape, is that its QWERTY keyboard doubles as a capacitive multitouch trackpad. This gives you two main advantages over the generic rectangular smartphone that aren’t immediately obvious from the pictures. Firstly, when editing text, the phone doesn’t move in your hands, and your attention doesn’t switch quite so much. Note "hands" – plural: this is a two-handed device. I particularly enjoyed being able to select and manipulate blocks of text very quickly. Secondly, when viewing things, such as a long web page or document, you can move your hands out of the way, and keep them out of the way - so they don’t obscure the screen. The best way to read web pages or ebooks is to rotate the Passport 90˚, and use the keyboard as a scrollpad. Of course you don’t have to, but that’s when you really start to appreciate that the eccentric design isn’t just for show. And this mode suits righties as well as lefties. It becomes natural quite quickly. Modern phones have gotten pretty tall – to get around this, Apple has a clumsy workaround in iOS 8 for its giant iPhone 6 Plus that allows you to pull the top of the display nearer your thumbs. 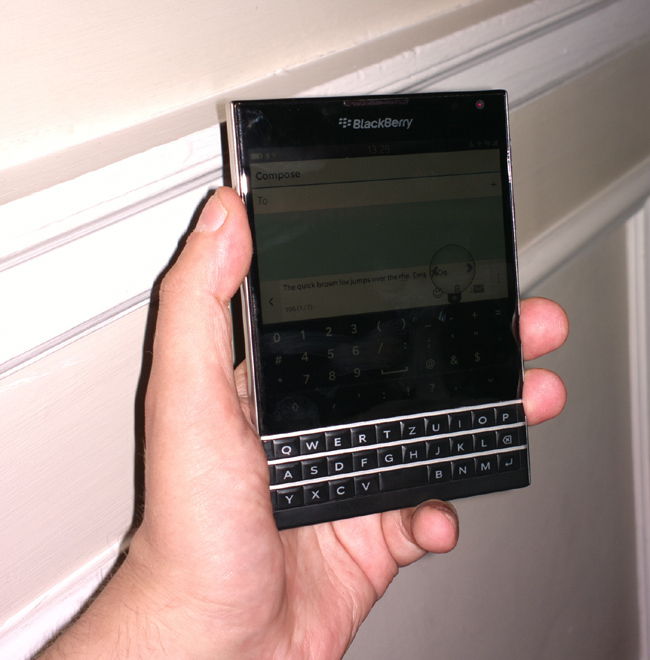 The Passport’s gesture keyboard makes that largely unnecessary. You can swipe from the top to bring down shortcuts and settings (rather like a more functional Android shortcuts panel), but you're not obliged to use this convenience (or inconvenience). The Passport comes with one other major USP, Blend software, which allows basic secure messaging and calendar management on your iPad, Android tablet, PC or Mac. For some this will be irrelevant or a distraction, for others, frustrated by the complexity of something like Outlook, this is a welcome adjunct. This isn't an Android phone but you wouldn't really know it. It runs Android apps without delay and without any perceptible lag. It's bundled with Amazon's app store for Android apps, which doesn't have the full range of Google's Play Store, but that does have freebies and other incentives. The only thing lacking from a bog standard modern Android is that the Passport doesn't support widgets, which can be quite useful. First impressions are of a solid, substantial, well-made device that’s weirdly larger and smaller than you think. Note how it’s shorter than a One M8. The official specs make it 128mm x 90.1mm x 9.3mm at its fattest, but the specs are fairly meaningless because it’s so different – you’re going to have to get used to it. The display is strikingly good: with a 453 dpi 4.5-inch screen, it’s a tremendous canvas for reading. BlackBerry says it typically displays much more of an eBook or email: 66 characters per line, rather than the 33 per line you see on the iPhone or the 29 of the Samsung Galaxy S5. Other basics have been considered. 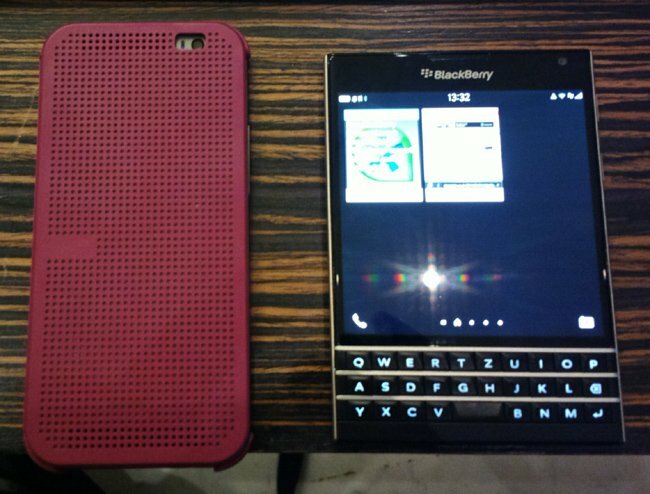 Passport boasts a terrific battery, sealed 3450mAh, with what BlackBerry claims is a 30-hour battery life. Testers tell us the device lasts two days comfortably, even with power-guzzling Android apps – BlackBerry more conservatively claims “a full day”. That’s needed to power the 2.2Ghz Quad Core processor (3GB of RAM). The Paratek antenna that made last year’s forgotten Z30 so capable in poor reception conditions is here, and BlackBerry has boosted the speakerphone to “louder than Boomsound™ levels – claiming it’s 18 per cent louder than HTC’s excellent stereo speakers found in its One M8. BlackBerry is aiming at the conference call suits here. More practically to a wider market, the Passport cleverly adjusts the call volume based on ambient background noise – you get a boost in a noisy street without having to fiddle with the volume buttons. It also has a 13MP rear camera with optical image stabilising software – decent enough but with no new gimmicks (The 10.3 software retains Facetime). 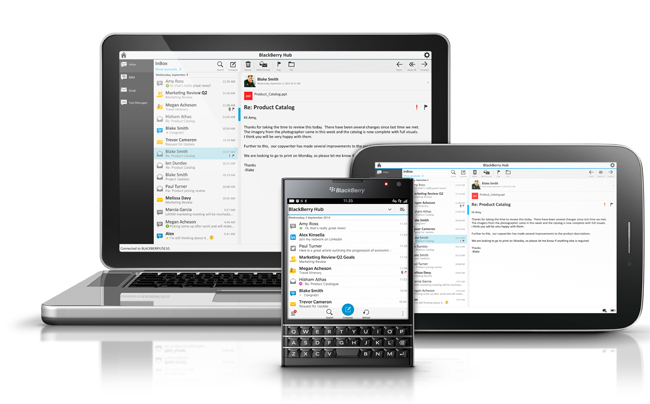 Instead of Android, there’s the latest BlackBerry OS, BB 10.3, with a new flatter look and hundreds of small improvements. That too is something of a Marmite design – underlying it is a unified messaging hub that gathers together alerts, SMSes, emails, call logs and other notifications. It’s especially useful for "email triage" – processing high volumes of messages quickly (the two defaults are move and delete). 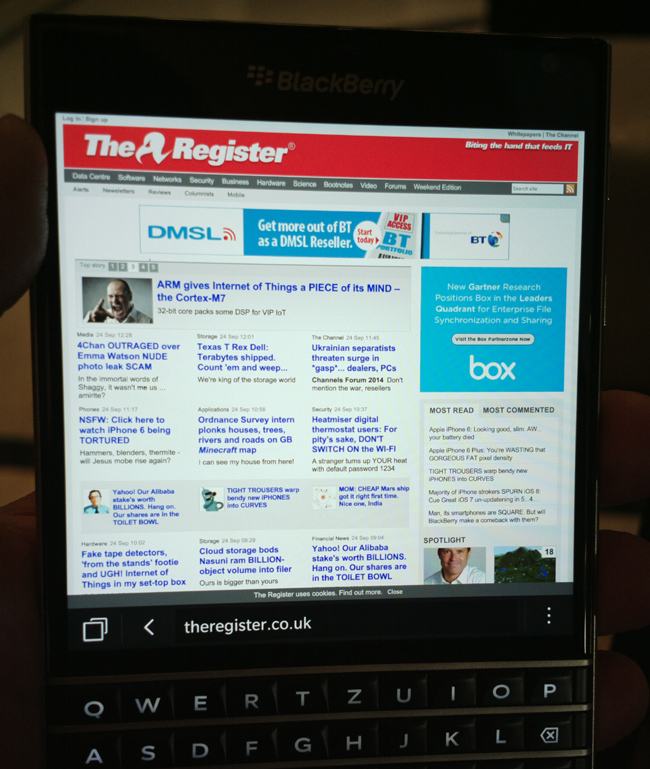 The Passport is designed to get BlackBerry noticed again – and it may well do that. But BlackBerry is aware most of its users operate it as a second phone – it’s quite a complementary device to a primary phone. 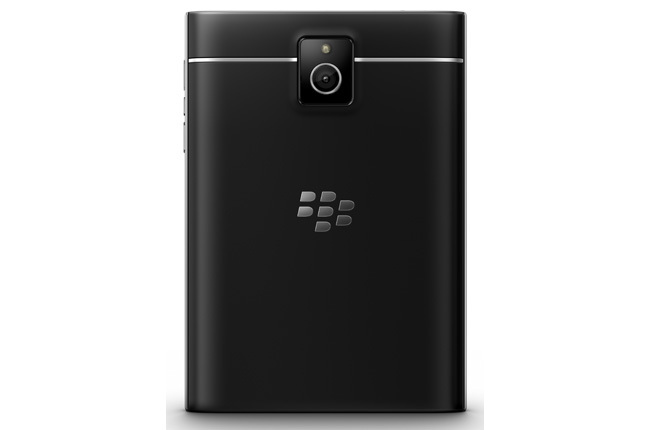 Out of the box, BB10 offers the most PDA-like suite on the market. However, if you install third-party Android apps like DigiCal or Tasks for Exchange, you’ll be able to trump that. Of course, you can do that here – Passport’s compatibility is good enough. Getting one in Blighty might be difficult - the networks won't have them until later this year. But Ingram Micro is apparently already shipping it, and it hits Carphone Warehouse on Friday. 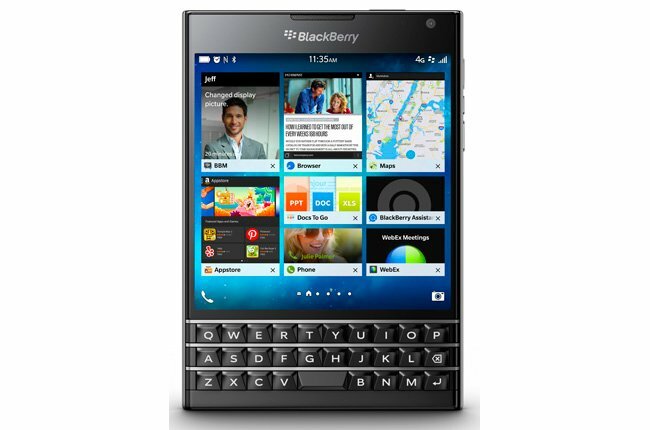 Alternatively, Brits can order one direct from the BlackBerry online store for £529, while France and Germany will pay €649, US $599 and homebase Canada $699.00 (Canadian). BlackBerry isn’t going to be ripping up the hit parade with this, but it’s seriously put itself back in contention with a powerful and practical phone for grown-ups, and grabs the ‘Think Different’ laurels back from Apple.